Industrial production accelerated in February from 6.1% to 6.9%, above the market consensus at 4.9%, with both the manufacturing and mining sectors performing strongly. The contribution from the energy sector was significantly lower, however, falling to just 0.2 percentage points from 1.3ppt, as cold weather boosted production in January. In manufacturing, a decent performance was led by the export sector – official statistics from GUS highlighted the double-digit growth of production in transportation equipment (20.5% year-on-year), electrical equipment (13.8%) and computers and electronics (12.6%YoY). Solid growth also came from the automotive sector (9.7%YoY), which suggests a recovery of orders from Germany. The production of consumer goods was also much stronger compared to 4Q. We expect growth in the industrial sector to moderate to approximately 4% in 2Q. 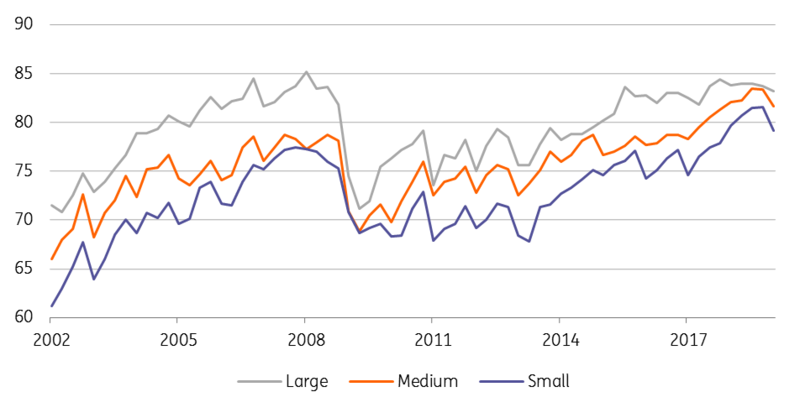 Capacity utilisation in small and medium enterprises decelerated compared to 4Q of 2018 but remains at a decent level. Furthermore, we expect a recovery in the second half of the year driven by domestic demand and government fiscal stimulus. Overall, we expect GDP this year to decelerate from 5.1% to 4.0%YoY.